Airports are where you come and go, and do a bit of shopping, obviously. I already spoke about my first purchase at Rhodes airport, but that perfume wasn't the only Korres item I bought. A shower gel that smells like Christmas in a bottle has to be something that I own in my life so I bought it. As the name of this shower gel suggests it smells like cinnamon and vanilla (€10,80/250ml). Now I love these spicy festive scents. Especially when it's that time of the year, but any day is an appropriate moment to get that bottle out of the cupboard and take a hot relaxing cinnamony bath or shower. For a bath I don't find the scent that strong. Maybe if you squeeze the entire bottle in the tub that it will actually smell like a cinnamon stick, but I think that's a bit of a waist. And as the product is meant for showers I am not that surprised that this product works way better for showers than for baths. It does give the most amazing bubbles though! After showering with this gel my entire skin smells like cinnamon and I love it. As I said before, I just love the scent all year round and if you are the same you will definitely fall head over heels in love with this. Not a massive fan of festive ginger cinnamon scents? No worry because Korres have a lot of other fruity scent too that I can't wait to try. 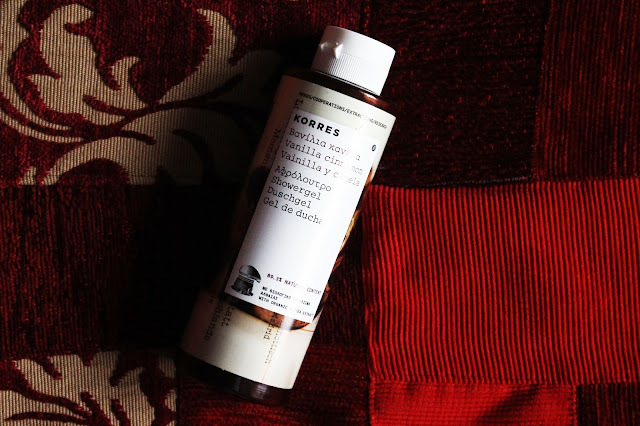 Have your tried anything from Korres before? What is your favourite scent?